'Wee Harry' (Barbara and David Schmieder, R. 2008). Seedling #97-HLC-1. MDB, 7" (18 cm). Midseason bloom. 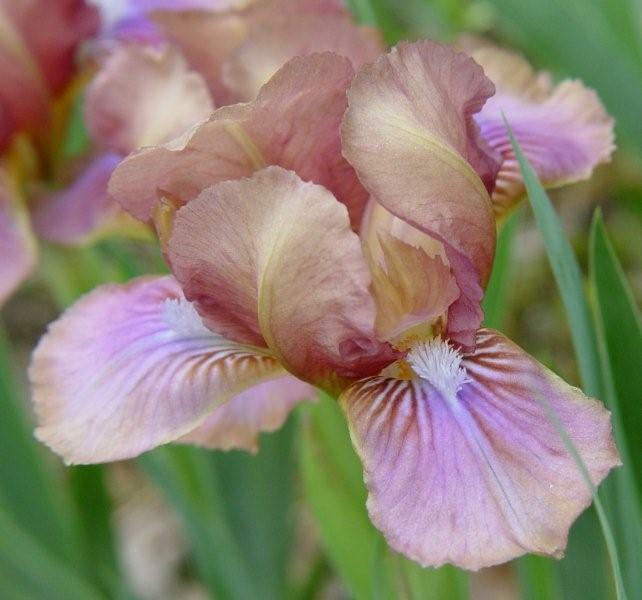 Standards and style arms buff; falls same, red purple veins at hafts coming forward to blend into pink wash over most of center of petal; beards white. 'Harry Hite' X seedling #94-LC-1: ('Low Snow' x 'Chanted'). ORNAC 2008. Honorable Mention 2012.
jpg Wee_Harry_Schmieder_garden_5-8-2004.jpg manage 49 K 28 Feb 2011 - 04:11 Main.ism+dhs Schmieder garden, Concord, MA, 5-8-2004.